Sometimes you just want chocolate. And that’s totally okay, even when you’re following a ketogenic diet. Just because it has the word chocolate in it doesn’t necessarily make it bad. Most chocolatey treats you can snag from the store are filled with harmful ingredients that do more harm than good to your body, even if they claim to be sugar free. 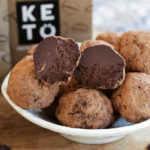 No one has time for that nonsense, which is why we created this keto Mocha Truffles recipe. These Mocha Truffles are low carb, gluten free, can be made dairy free, and have so many health benefits packed into each little truffle. They’ll give your body energy, your brain a boost, support your heart, improve your digestion, and keep you right in ketosis where you belong. Name a store-bought mocha truffle that can do that? Cacao is one of those magical natural ingredients that not only tastes delicious but puts you in a blissful mood. Research has shown that cacao directly impacts the release of neurotransmitters that can lead to positive emotions of euphoria and happiness. Just another reason why chocolate is always a great gift for your spouse [*][*]. Dark chocolate is rich with flavonoids which deliver powerful fuel to your brain. It supports mental clarity and focus, and studies have shown that it can improve the conditions of those suffering from various cognitive complications [*][*][*]. Our Perfect Keto Instant Coffee Mocha combines coffee and MCT oil powder that gives you the boost you need. The MCTs deliver fast-acting, sustainable brain fuel, enabling you to apply sharper concentration and mental focus on the task at hand. Cacao delivers a powerful punch of antioxidants to your body which is great for your heart health and blood flow. Research has shown how cacao can help improve blood pressure and cardiovascular function [*]. Similarly, dark chocolate is rich with antioxidants and flavonoids that greatly benefit your blood health. Multiple studies have shown the positive effects that dark chocolate has on heart health including reduction in blood pressure, improving the lining of the arteries, and overall decrease in risks of cardiovascular complications [*][*][*][*][*]. Coconut cream is an excellent source of fatty acids that improve heart health. Research has shown that these essential properties in coconut milk can properly regulate your blood pressure and cholesterol levels by increasing levels of HDL “good” cholesterol and reducing levels of LDL “bad” cholesterol [*]. Dark chocolate and Cacao provides a solid dose of polyphenols which have been shown improve digestive function and intestinal health. Specifically, these essential properties found within cacao have been linked to aiding in the alleviation of diarrhea [*][*]. Coconut cream provides valuable aid to your gut health and digestive system. Through delivering much needed hydration and electrolytes to your system it can help relieve constipation and diarrhea and improve overall digestive flow and regularity. Make sure you add this gem to your ever-growing list of keto recipes and double up so you can always have some of these tasty treats on hand! 1. Add chopped cacao, cocoa powder or baking chocolate to a glass bowl. Set aside. 2. Add cream, coffee packet, and sweetener to a small saucepan set to medium-low heat. Heat until sweetener dissolves and mixture is hot, but not simmering. Turn off heat and remove pan. 3. Pour cream mixture over cacao/chocolate. Let chocolate melt for 1-2 minutes then stir with a fork or spoon. Stir until ganache is combined. It will be thick. Refrigerate for 10-15 minutes until firm. 4. Line a baking sheet with parchment paper and add cacao powder to a small bowl. Remove ganache from fridge and spoon small portions out with a cookie scoop. Roll truffles in cacao powder and place on parchment paper. 5. Allow truffles to sit out a bit to soften slightly if needed. Store leftovers in fridge. 12 Research-Backed Benefits Of Whey Protein PowderIs Whey Protein Good For You?